I uncovered a few, never installed, Bow handles. These have the ‘HLB” letters etched into them. If anyone is looking for a new, original Hiliner Bow Handle, please let me know. I will try to get a picture up. I also found some of the triangle sheetmetal trim pieces that go on the each side at the rear. I have two sizes, both left and right side. Unfortunately I have not been able to find any of the Bow logo plates. 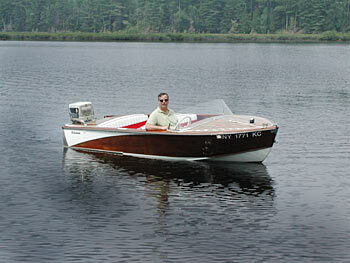 I have decided that I need to sell at least one of my three boats. I don’t have the space or time to care for all three. Please let me know if you are interested in any of them. 1960 Fleetstar – 55hp Suzuki Motor. I put a new windshield on last year. Needs some minor work. Needs a new top, but i have the hardware and the old mice chewed top. Was in the water this past year. 1961 Coast Clipper – No Motor, Barn Find. Hasn’t been in the water in close to 30 years. Side windows are intact. Would make a great project. Very Rare. Found this picture at this link. Not sure if its still available. But i haven’t seen very many of the 14′ boats.